"Grandad", "Grandfather", "Grandma", and "Grandpa" redirect here. For other uses, see Grandad (disambiguation), Grandfather (disambiguation), Grandma (disambiguation), and Grandpa (disambiguation). In cases where parents are unwilling or unable to provide adequate care for their children (e.g., death of the parents, financial obstacles, marriage problems), grandparents often take on the role of primary caregivers. Even when this is not the case, and particularly in traditional cultures, grandparents often have a direct and clear role in relation to the raising, care and nurture of children. Grandparents are second-degree relatives and share 25% genetic overlap. A step-grandparent can be the step-parent of the parent or the step-parent's parent or the step-parent's step-parent (though technically this might be called a step-step-grandparent). The various words for grandparents at times may also be used to refer to any elderly person, especially the terms gramps, granny, grandfather, grandmother, nan, maw-maw, paw-paw and others which families make up themselves. When used as a noun (e.g., "... a grandparent walked by"), grandfather and grandmother are usually used, although forms such as grandma/grandpa, granny/granddaddy or even nan/pop are sometimes used. When preceded by "my ..." (e.g., "... my grandpa walked by"), all forms are common (anywhere from "... my grandfather ..." to "... my Gramps ..."). All forms can be used in plural, but Gramps (plural Gramps) is rare. In writing, Grandfather and Grandmother are most common, but very rare when referring to a grandparent in person. In speech, Grandpa and Grandma are commonly used in the United States, Canada, Australia and the United Kingdom. In Britain, Ireland, United States, Australia, New Zealand and, particularly prevalent in the Canadian province of Newfoundland and Labrador, Nan, Nana, Nanna, Nanny, Gran and Granny and other variations are often used for grandmother in both writing and speech. In many parts of India, maternal grandparents are called Nana and Nani. Similarly, paternal grandparents are called Dada and Dadi. One's mother's grandparents are called Par-nani and Par-nana. On similar lines, father's grandparents are called Par-dadi and Par-dada. Numerous other variants exist, such as Gramp, Gramps, Grampa, Grandpap, Granda, Grampy, Granddad, Grandad, Granddaddy, Grandpappy, Pop(s), Pap, Pappy, and Pawpaw for grandfather; Grandmom, Grandmama, Grama, Granny, Gran, Nanny, Nan, Mammaw and Grammy for grandmother. Gogo can be used for either, etc. Given that people may have two living sets of grandparents, some confusion arises from calling two people "grandma" or "grandpa", so often two of the other terms listed above are used for one set of grandparents. Another common solution is to call grandparents by their first names ("Grandpa George", "Grandma Anne", etc.) or by their family names ("Grandpa Jones", "Grandma Smith"). 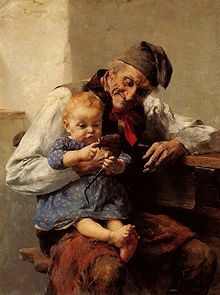 In North America, many families call one set of grandparents by their ethnic names (e.g., Hispanic grandparents might be called abuelo and abuela or "abuelito" and "abuelita", French grandparents might be called papi and mamie, Italian grandparents might be called nonno and nonna, or Dutch and German grandparents might be called Opa and Oma. In Flanders pepee or petje and memee or metje are most used). In Friesland, a common pair is pake and beppe. Mandarin-speaking Chinese Americans refer to maternal grandparents as wài pó (外婆) and wài gōng (外公) and paternal grandparents as nǎi nǎi (奶奶) and yé yé (爷爷). In the Philippines, grandparents are called lolo (grandfather) and lola (grandmother), respectively. Languages and cultures with more specific kinship terminology than English may distinguish between paternal grandparents and maternal grandparents. For example, in the Swedish language there is no single word for "grandmother"; the mother's mother is termed mormor and the father's mother is termed farmor. However, the other Scandinavian languages, Danish and Norwegian, use words which specifies the kinship like in Swedish (identically spelled among all three languages), as well as using common terms similar to grandmother (Danish: bedstemor, Norwegian: bestemor). 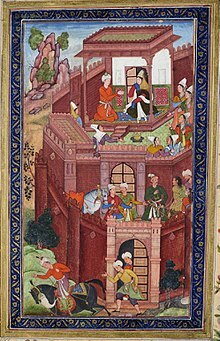 Timurid conqueror Babur seeks the advice of his grandmother. The parents of a grandparent, or the grandparents of a parent, are called the same names as grandparents (grandfather/-mother, grandpa/-ma, granddad/-ma, etc.) with the prefix great- added, with an additional great- added for each additional generation. One's great-grandparent's parents would be "great-great-grandparents". To avoid a proliferation of "greats" when discussing genealogical trees, one may also use ordinals instead of multiple "greats"; thus a "great-great-grandfather" would be the "second great-grandfather", and a "great-great-great-grandfather" would be a third great-grandfather, and so on. This system is used by some genealogical websites such as Geni. One may also use cardinal numbers for numbering greats, for example, great-great-great-grandmother becomes 3×-great-grandmother. Individuals who share the same great-grandparents but are not siblings or first cousins are called "second cousins" to each other, as second cousins have grandparents who are siblings. Similarly, "third cousins" would have great-grandparents who are siblings. The use of the prefix "grand-" dates from the early 13th century, from the Anglo-French graund. The term was used as a translation of Latin magnus. The prefix "great-" represents a direct translation of Anglo-French graund and Latin magnus to English. In Old English, the prefixes ealde- (old) and ieldra- (elder) were used (ealdefæder/-mōdor and ieldrafæder/-mōdor). A great-grandfather was called a þridda fæder (third father), a great-great-grandfather a fēowerða fæder (fourth father), etc. Grandparents are changing their roles in contemporary world, especially they are becoming increasingly involved in childcare. Since 2007, approximately one-third of children in the U.S. live in a household consisting of both parents and a grandparent. Around 67% of these households are also maintained by either two grandparents, or a grandmother. Likewise, more than 40% of grandparents across 11 European countries care for their grandchildren in the absence of the parents. In Britain, around 63% of grandparents care for their grandchildren who are under 16 years old. Grandparent involvement is also common in Eastern societies. For instance, 48% of grandparents in Hong Kong reported that they are taking care of their grandchildren. In China, around 58% of Chinese grandparents who are aged 45 or older are involved in childcare. In Singapore, 40% of children from birth to three years old are cared by their grandparents and this percentage is still increasing. In South Korea, 53% of children under the age of 6 years old are cared by their grandparents. Therefore, grandparents taking care of their grandchildren has become a prevalent phenomenon around the world. There are a few reasons why grandparent involvement is becoming more prevalent. First, life expectancy has increased while fertility rates have decreased. This means that more children are growing up while their grandparents are still alive, whom can become involved in childcare. In addition, the reduced fertility rates mean that grandparents can devote more attention and resources to their only grandchildren. Second, more mothers are involved in the workforce, and thus, other caregivers need to be present to care for the child. For instance, in Hong Kong, 55% of grandparents reported that they took care of their grandchild because his or her parents have to work. In South Korea, 53% of working mother reported that they once received child care services from their parents. Third, the increasing number of single-parent families creates a need for grandparental support. The degree of grandparent involvement also varies depending on the societal context, such as the social welfare policies. For example, in European countries such as Sweden and Denmark, where formal childcare is widely available, grandparents provide less intensive childcare. By contrast, in European countries such as Spain and Italy, where formal childcare is limited, and welfare payment is low, grandparents provide more intensive childcare. In Singapore, the grandparent caregiver tax relief was established in 2004, which enables working parents (Singapore citizens with children age 12 and below) whose children are being cared for by unemployed grandparents to receive income tax relief of 3,000 Singaporean dollars. There are different types of grandparental involvement, including nonresident grandparents, co-resident grandparents, grandparent-maintained household, and custodial grandparents. Nonresident grandparents: Grandparents who do not live with their grandchildren, but provide care for them, such as picking them up from school. Co-resident grandparents: Grandparents who live with their grandchild, as well as his/her parents. This type of household is also known as three-generational households. According to a report that uses data from the 2010 Census, the American Community Survey (ACS), the Current Population Survey (CPS), and the Survey of Income and Program Participation (SIPP), co-resident grandparents are more likely to be in poverty and suffer from an illness or disability. Grandparent-maintained households: A grandparent who is in charge of the household. In this type of household, the parents may or may not be present. In the USA, 33% of children who live in a grandparent-maintained household have only the grandparents present; this is comparable to another 30% who live with a grandmother and one or more parents. Custodial grandparents: Grandparents who raise their grandchildren without the presence of the grandchildren’s parents in the household. This type of involvement is especially common among ethnic minority groups. For instance, approximately 50% of custodial grandparents in the USA belong to an ethnic minority group. In general, grandparents adopt the primary caregiving role for various reasons, such as when the grandchild is neglected or abused by his/her parents, when his/her parents suffer from drug and/or alcohol addiction, when his/her parents have relocated due to job demands, died, incarcerated, or deployed. In some cases, parents remain in contact with their children. Grandparents have different functions in child development. Not only do they provide instrumental support such as picking grandchildren from school or feeding them, but they also offer emotional support. Furthermore, grandparents protect children from being impacted by negative circumstances, such as harsh parenting, poor economic status, and single-parent families. In addition to providing support, grandparents can also help grandchildren with their schoolwork or teach them values that are integral to their society. Grandparents can have a positive or negative impact on child development. On the one hand, previous research suggests that children and adolescents who have a close relationship with their grandparents tend to have better well-being, experience fewer emotional problems, and demonstrate fewer problematic behaviours. They are also more academically engaged and are more likely to help others. On the other hand, there are also research studies indicating that grandparent involvement is associated with more hyperactivity and peer difficulties among young children. In other words, children who are cared for by their grandparents can have more interpersonal relationship problems. Also, children who are under the care of their grandparents have poorer health outcomes such as obesity, and more injuries due to low safety awareness. Since taking care of grandchildren could be a highly demanding job that requires constant energy and time devotion, grandparental involvement in child raising could have a negative impact on grandparents’ physical and emotional health. For example, taking care of grandchildren can reduce grandparents’ own time for self-care such as missing their medical appointments. Therefore, they are likely to have a higher chance to suffer from physical health issues. In the USA, compared with those who do not take care of their grandchildren, grandparents who are involved in childcare are more likely to have poor physical conditions, such as heart disease, hypertension or body pain. Besides physical health issues, grandparents are also likely to have emotional issues. To be more specific, raising young children again could be a stressful and overwhelming experience and thus results in different kinds of negative emotions such as anxiety or depression. In addition to physical and emotional issues, grandparents who are involved in caring for their grandchildren can also suffer socially. For instance, grandparents will be forced to limit their social activities so as to care for their grandchildren. By doing so, grandparents become more isolated from their social relations. Taking care of grandchildren also means more responsibilities, grandparents would fear for their grandchildren’s future well-being because of their disability and death in the future. If grandparents cannot handle the caregiver role of their grandchildren well, this job can eventually become a burden or stressor and bring more severe physical health and emotional issues to grandparents. However, there are also positive effects of being involved in grandchildren raising. Compared with grandparents who do not provide caregiving to their grandchildren, those who take care of their grandchildren with long hours are more likely to have better cognitive functions. To be more specific, taking care of grandchildren helps elder grandparents maintain their mental capacities in later life, they are also less likely to develop diseases such as dementia. Moreover, frequent interactions with their grandchildren could reduce the cognitive aging process, allowing grandparents a chance to live a more vibrant and active life. Grandparents also get benefits of physically exercising more during this process. Taking care of grandchildren can also have benefits on grandparents’ emotional health. As an example, many grandparents start to feel a sense of purpose and meaning in life again after their retirement; as another example, their ties with their adult children and grandchildren are also strengthened. Many grandparents also think of the caregiving experience as positive because it provides another chance for them to make up mistakes they made with their own children and give them more opportunities to educate their grandchildren and improve their parenting styles. Grandparental involvement differs between Western and Eastern cultures. Grandparents taking care of their grandchildren is a common phenomenon in China due to Chinese traditions which emphasize family harmony, collective well-being, intergenerational exchanges and filial responsibilities. China’s unique philosophies, Buddhism and Taoism, play important roles in forming these cultural values. While Chinese Buddhism emphasizes prioritized role of the family in Chinese society and harmonious relations among family members, Taoism emphasizes the importance of harmony in interpersonal relations and relations between nature and the humans. These philosophies underline the important role that families play in Chinese cultures. Besides cultural factors, grandparents taking care of their grandchildren also appears in the context in which their adult children need to work full-time, and the child care services are either too expensive (in big cities) or too scarce (in remote areas). Grandparents serving as their grandchildren’s caregiver is particularly common in rural China. Due to the fast development of urbanization in China since the 1980s, up to 220 million migrant workers from rural areas move to urban areas to seek for more job opportunities, which leave around 58 million children behind in rural areas, grandparents, therefore, undertake the role of parents and become caregivers to their grandchildren. A new population named “left-behind grandparents” appears in this context, these grandparents live in rural China, and their main job is to look after their grandchildren, most of these grandparents are facing financial burdens and wish their adult children could come back. The mental and physical health of “left-behind grandparents” needs more attention from the public. Even though in urban areas where child care services are available, nearly all grandparents still prefer to take care of their grandchildren voluntarily. Not only because this can reduce their adult children’s financial burdens on child care services but also taking care of their own grandchildren is a more effective way to maintain family harmony. In the USA, taking care of grandchildren is not a necessary responsibility of grandparents. Grandparents taking care of their grandchildren is often caused by involuntary events or crisis, and it is more like a solution to a problem, not an initiative desire, which is a distinct difference from that in China. For example, grandparents in the USA often take care of their grandchildren when their adult children get into troubles such as substance abuse, incarceration or parental death. Differences also exist in different ethnicities in the USA, Caucasian individuals generally regard individual independence as more important, so grandparents are less likely to take care of their grandchildren. However, African American and Latino individuals are more likely to regard looking after grandchildren as a family tradition and are more willing to provide help for their adult children. Ethnic differences in grandparents looking after their grandchildren reflect different cultural values that different ethnic groups hold. To be more specific, African American grandparents are more likely to provide guidance and discipline to their grandchildren due to their flexible family system in which relatives, nonblood kin are all willing to help each other. Latino families have a strong preference to live together and keep frequent contact with family members because most of them are immigrants or first-generation born in the USA, they are more likely to live and function as a unit. Grandparents in Latino culture also play important roles in stabilizing the family unit as family leaders. 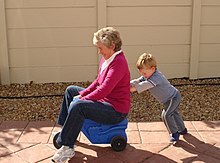 Although Caucasian grandparents are less likely to raise their grandchildren, they have more cognitive or physical burdens of taking care of grandchildren compared with other ethnic groups, mainly because their caregiver roles are less normative, and they rely more on remote or companionate parenting styles. On the contrary, African American and Latino grandparents rely more on disciplinary and instructional parenting styles and they are less likely to have cognitive or physical burdens when taking care of their grandchildren. Coulthard, Carmen Caldas; Moon, Rosamund (2016). "Grandmother, gran, gangsta granny: semiotic representations of grandmotherhood". Gender and Language. 10 (3): 309–339. doi:10.1558/genl.v10i3.32036. ^ Zhavoronkov, Alex (2013-07-02). "13 Reasons Why We Will Live Longer Than Our Parents". Huffington Post. Retrieved 2018-08-23. ^ Wong, Kate. "The Mysterious Downfall of the Neandertals". Scientific American. Retrieved 2013-03-24. ^ Caspari, R. (2012). "The Evolution of Grandparents". Scientific American. 22: 38–43. doi:10.1038/scientificamericanhuman1112-38. ^ "8 Reasons Parents Fail to Love Their Kids". Psychology Today. Retrieved 2018-08-23. ^ "Family Tree & Family History at". Geni.com. Retrieved 2013-03-24. ^ "Online Etymology Dictionary". Etymonline.com. Retrieved 2013-03-24. ^ "Online Etymology Dictionary". Etymonline.com. 1957-10-01. Retrieved 2013-03-24. ^ Ochiltree, Gay (2006-11-24). "The changing role of grandparents". Child Family Community Australia. Retrieved 2018-08-23. ^ a b c d e f g Ellis, Renee; Simmons, Tavia (October 2014). "Coresident Grandparents and Their Grandchildren: 2012" (PDF). ^ a b c d Glaser, Karen; Price, Debora; Montserrat, Eloi Ribe; di Gessa, Giorgio; Tinker, Anthea (March 2013). "Grandparenting in Europe: Family policy and grandparents' role in providing childcare". Grandparents Plus. ^ a b "Family Survey 2015" (PDF). Family Council. November 2016. ^ Ko, Pei-Chun; Hank, Karsten (2013). "Grandparents caring for grandchildren in China and Korea: Findings from CHARLS and KLoSA". Journals of Gerontology Series B. 69 (4): 646–651. doi:10.1093/geronb/gbt129. PMID 24378959. ^ a b Thang, Leng Leng; Mehta, Kalyani; Usui, Tsuneo; Tsuruwaka, Mari (2011-12-01). "Being a Good Grandparent: Roles and Expectations in Intergenerational Relationships in Japan and Singapore". Marriage & Family Review. 47 (8): 548–570. doi:10.1080/01494929.2011.619303. ISSN 0149-4929. ^ a b Kim, Hye Jin (2017-02-02). "Grandparents providing care for grandchildren and employment status of grandparents in South Korea". Journal of Women & Aging. 30 (1): 49–61. doi:10.1080/08952841.2016.1259443. ISSN 0895-2841. PMID 28151086. ^ Arber, Sara; Timonen, Virpi (2012). "Grandparenting in the 21st century: New directions". In Arber, Sara; Timonen, Virpi. Contemporary Grandparenting: Changing Family Relationships in Global Contexts. Great Britain: The Policy Press. pp. 247–264. ^ Lam, TianYuan; Lam, Chun Bun; Chan, Kevin Ka-Shing (2017). "Grandparental involvement and young adults' cognitive and social adjustment: The moderating role of filial piety in Hong Kong". Journal of Social and Personal Relationships. 35 (7): 999–1018. doi:10.1177/0265407517702011. ^ a b c d e Dunifon, Rachel (2012). "The influence of grandparents on the lives of children and adolescents". Child Development Perspectives. 7: 55–60. doi:10.1111/cdep.12016. ^ a b c Margaret, Platt Jendrek (1994). "Grandparents who parent their grandchildren: circumstances and decisions". The Gerontologist. 34 (2): 206–216. doi:10.1093/geront/34.2.206. ^ Kataoka-Yahiro, Merle; Ceria, Clementina; Caulfield, Rick (2004). "Grandparent caregiving role in ethnically diverse families". Journal of Pediatric Nursing. 19 (5): 315–328. doi:10.1016/j.pedn.2004.05.010. PMID 15614256. ^ Stykes, Bart; Manning, Wendy D.; Brown, Susan L. "Grandparenthood in the U.S.: Residence Status of Grandparents" (PDF). Retrieved November 20, 2017. ^ a b Xu, Ling; Chi, Iris (2015). "Ageing and grandparenting in Asia". In Quah, Stella R. Routledge handbook of families in Asia. New York: Routledge. pp. 246–258. ^ a b Barnett, Melissa A.; Scaramella, Laura V.; Neppl, Tricia K.; Ontai, Lenna L.; Conger, Rand D. (2010). "Grandmother involvement as a protective factor for early childhood social adjustment". Journal of Family Psychology. 24 (5): 635–645. doi:10.1037/a0020829. PMC 2976599. PMID 20954774. ^ a b Ruiz, Sarah A.; Silverstein, Merril (2007). "Relationships with grandparents and the emotional well-being of late adolescent and young adult grandchildren". Journal of Social Issues. 63 (4): 793–808. doi:10.1111/j.1540-4560.2007.00537.x. ^ Yorgason, Jeremy B; Padilla-Walker, Laura; Jackson, Jami (2011). "Nonresidential grandparents' emotional and financial involvement in relation to early adolescent grandchild outcomes". Journal of Research on Adolescence. 21 (3): 552–558. doi:10.1111/j.1532-7795.2010.00735.x. ^ a b Fergusson, Emma; Maughan, Barbara; Golding, Jean (2007). "Which children receive grandparental care and what effect does it have?". Journal of Child Psychology and Psychiatry. 49 (2): 161–169. doi:10.1111/j.1469-7610.2007.01840.x. PMID 17979960. ^ Pulgaron, Elizabeth R.; Marchante, Ashley N.; Agosto, Yaray; Lebron, Cynthia N.; Delamater, Alan M. (2016). "Grandparent involvement and children's health outcomes: the current state of the literature". Families, Systems & Health. 34 (3): 260–269. doi:10.1037/fsh0000212. PMC 5025375. PMID 27505069. ^ Winefield, Helen; Air, Tracy (2010). "Grandparenting". International Journal of Evidence-Based Healthcare. 8 (4): 277–283. doi:10.1111/j.1744-1609.2010.00187.x. ^ Baker, Lindsey A.; Silverstein, Merril (2008-09-08). "Depressive Symptoms Among Grandparents Raising Grandchildren: The Impact of Participation in Multiple Roles". Journal of Intergenerational Relationships. 6 (3): 285–304. doi:10.1080/15350770802157802. ISSN 1535-0770. PMC 2772115. PMID 19890447. ^ Lee, Sunmin; Colditz, Graham; Berkman, Lisa; Kawachi, Ichiro (2003-11-01). "Caregiving to Children and Grandchildren and Risk of Coronary Heart Disease in Women". American Journal of Public Health. 93 (11): 1939–1944. doi:10.2105/ajph.93.11.1939. ISSN 0090-0036. PMC 1448080. PMID 14600070. ^ Musil, Carol; Warner, Camille; Zauszniewski, Jaclene; Wykle, May; Standing, Theresa (2008-11-19). "Grandmother Caregiving, Family Stress and Strain, and Depressive Symptoms". Western Journal of Nursing Research. 31 (3): 389–408. doi:10.1177/0193945908328262. PMC 2883890. PMID 19261805. ^ Ehrle, Glenda M.; Day, H. D. (1994-02-01). "Adjustment and family functioning of grandmothers rearing their grandchildren". Contemporary Family Therapy. 16 (1): 67–82. doi:10.1007/bf02197603. ISSN 0892-2764. ^ a b c Hayslip, Bert; Kaminski, Patricia L. (2005-04-01). "Grandparents Raising Their Grandchildren: A Review of the Literature and Suggestions for Practice". The Gerontologist. 45 (2): 262–269. doi:10.1093/geront/45.2.262. ISSN 0016-9013. ^ a b c d Zhou, Jing; Mao, Weiyu; Lee, Yura; Chi, Iris (2016-01-04). "The Impact of Caring for Grandchildren on Grandparents' Physical Health Outcomes: The Role of Intergenerational Support". Research on Aging. 39 (5): 612–634. doi:10.1177/0164027515623332. PMID 26733495. ^ a b Arpino, Bruno; Bordone, Valeria (2014-04-01). "Does Grandparenting Pay Off? The Effect of Child Care on Grandparents' Cognitive Functioning". Journal of Marriage and Family. 76 (2): 337–351. doi:10.1111/jomf.12096. ISSN 1741-3737. ^ Hauser, Robert M.; Weir, David (2010-03-01). "Recent developments in longitudinal studies of aging in the United States". Demography. 47 (1): S111–S130. CiteSeerX 10.1.1.639.1281. doi:10.1353/dem.2010.0012. ISSN 0070-3370. ^ Hughes, Mary Elizabeth; Waite, Linda J.; LaPierre, Tracey A.; Luo, Ye (2007-03-01). "All in the Family: The Impact of Caring for Grandchildren on Grandparents' Health". The Journals of Gerontology: Series B. 62 (2): S108–S119. doi:10.1093/geronb/62.2.s108. ISSN 1079-5014. PMC 2562755. PMID 17379680. ^ Xu, Ling; Tang, Fengyan; Li, Lydia W.; Dong, Xin Qi (2017-07-01). "Grandparent Caregiving and Psychological Well-Being Among Chinese American Older Adults—The Roles of Caregiving Burden and Pressure". The Journals of Gerontology: Series A. 72 (suppl_1): S56–S62. doi:10.1093/gerona/glw186. ISSN 1079-5006. PMID 28575256. ^ Crowther, Martha R.; Huang, Chao-Hui (Sylvia); Allen, Rebecca S. (2015-09-02). "Rewards and unique challenges faced by African-American custodial grandmothers: the importance of future planning". Aging & Mental Health. 19 (9): 844–852. doi:10.1080/13607863.2014.967175. ISSN 1360-7863. PMID 25345592. ^ Lee, Kin Cheung (George); Oh, Alice; Zhao, Qianru; Wu, Fang-Yi; Chen, Shiyun; Diaz, Thomas; Ong, Chez Kuang (2017-07-03). "Repentance in Chinese Buddhism: Implications for Mental Health Professionals". Journal of Spirituality in Mental Health. 19 (3): 210–226. doi:10.1080/19349637.2016.1204258. ISSN 1934-9637. ^ Chen, Ellen Marie; Center, Philosophy Documentation (1969-08-01). "Nothingness and the Mother Principle in Early Chinese Taoism". International Philosophical Quarterly. 9 (3): 391–405. doi:10.5840/ipq19699332. ^ a b Cong, Zhen; Silverstein, Merril (April 2012). "Caring for grandchildren and intergenerational support in rural China: a gendered extended family perspective". Ageing & Society. 32 (3): 425–450. doi:10.1017/s0144686x11000420. ISSN 1469-1779. ^ 滕雪. "【吾老吾幼·大山深处的留守】留守祖母：大山深处的奉献与思念_新闻频道_央视网(cctv.com)". news.cctv.com. Retrieved 2017-11-23. ^ "留守奶奶去世多日无人知 1岁半孙女险饿死". news.ifeng.com. Retrieved 2017-11-23. ^ Minkler, Meredith; Driver, Diane; Roe, Kathleen M.; Bedeian, Katherine (1993-12-01). "Community Interventions To Support Grandparent Caregivers". The Gerontologist. 33 (6): 807–811. doi:10.1093/geront/33.6.807. ISSN 0016-9013. ^ Goodman, Catherine; Silverstein, Merril (2002-10-01). "Grandmothers Raising Grandchildren". The Gerontologist. 42 (5): 676–689. doi:10.1093/geront/42.5.676. ISSN 0016-9013. ^ Sandra Edmonds Crewe PhD, ACSW, MSW (2007-01-01). "Different Pathways to a Common Destiny". Journal of Health & Social Policy. 22 (3–4): 199–214. doi:10.1300/J045v22n03_13. ISSN 0897-7186. ^ Angel, Jacqueline L.; Angel, Ronald J.; McClellan, Judi L.; Markides, Kyriakos S. (1996-08-01). "Nativity, Declining Health, and Preferences in Living Arrangements Among Elderly Mexican Americans: Implications for Long-term Care". The Gerontologist. 36 (4): 464–473. doi:10.1093/geront/36.4.464. ISSN 0016-9013. ^ Szinovácz, Maximiliane (1998). Handbook on Grandparenthood. Greenwood Publishing Group. ISBN 9780313298868. ^ Pruchno, Rachel (1999-04-01). "Raising Grandchildren: The Experiences of Black and White Grandmothers". The Gerontologist. 39 (2): 209–221. doi:10.1093/geront/39.2.209. ISSN 0016-9013. ^ 1948–, Cherlin, Andrew J. (1992). The new American grandparent : a place in the family, a life apart. Furstenberg, Frank F., 1940– (1st Harvard University Press pbk. ed.). Cambridge, MA: Harvard University Press. ISBN 9780674029484. OCLC 434586472. Look up grandparent, grandfather, grandmother, grandpa, grandma, or grampa in Wiktionary, the free dictionary.